A.	Genesis 1&2 gives a detailed account of how God created the heavens and the earth, and all life on earth. B. The Bible doesn't teach absurd theories of origins such as the eternality of matter, spontaneous generation, or evolution. A.	Christianity is the religion of God which began at Creation; it did not start in the first century. B. It is a reformation of the Mosaic religion (Heb 9:10). C.	The reformation of the Mosaic religion was not man-made, it had been prophesied in the Jewish scriptures (Dan 2:44; Rom 15:12). D.	The Mosaic religion was a temporary form of religion between the patriarchal times of Abraham, Isaac, and Jacob until the coming of the prophesied Messiah, Jesus Christ (Gal 3:19). E.	Archaeological evidence has verified many of the Biblical accounts from the Exodus of Israel from Egypt, to the conquest of the land of Canaan, to the first century (see: "Patterns of Evidence: The Exodus" documentary). F.	Before God called Abraham, the Bible records that in the days of Noah God flooded the earth. G.	This fact is substantiated by the fact that there are rock layers with billions of fossils in them laid down all over the earth, which is what we would expect to see if there was a global flood. H.	Before the flood, the Bible gives records of generations of men going back to Abel, Adam and Eve's son who by faith worshiped God in the way that God prescribed (Heb 11:4 c/w Gen 4:4). i. The earth being a circle (Isa 40:22). ii. The earth being suspended in space, hanging upon nothing (Job 26:7). iii. The water cycle (Ecc 1:7). B. The Bible affirms the laws of science. i. The first law of thermodynamics (Heb 11:3). ii. The second law of thermodynamics (Psa 102:25-26; Isa 51:6). iii. The law of biogenesis (Gen 1:20-25). iv. An expanding universe (Isa 40:22; Isa 42:5; Isa 44:24; Isa 51:13). C.	The Bible is historically accurate. i. 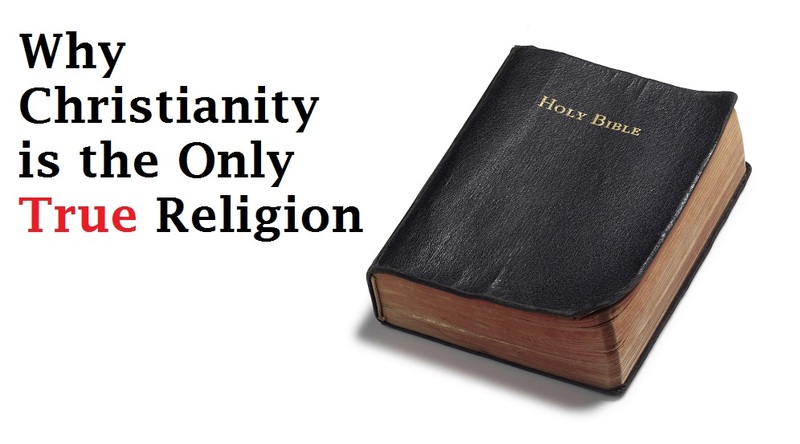 The Bible is not a book like the Book of Mormon which is full of fictional people and places for which there is no historical or archaeological evidence. ii. The Bible references people and kingdoms such as the Caesars, Herods, the Roman Empire, the Medo-Persian empire, Darius, Cyrus, the Babylonian empire, Nebuchadnezzar, the Assyrian empire, the Egyptian empire, the Pharaohs, Jericho, and many more which have all been historically and archaeologically verified. A. There are hundreds of fulfilled prophesies of Jesus Christ which prove the veracity of the Bible and the God who inspired men to write it (Isa 42:8-9; Isa 46:10). i. The precise year of the Messiah's appearance was prophesied by Daniel almost 500 years before it happened (Dan 9:24-25). a. This prophecy is so undeniably accurate that it has forced skeptics to argue that it was written after the birth of Christ. b.	Daniel's prophecy also details the rise of the Greek empire and the conquest of Alexander the Great, Antiochus Epiphanies, the rise of the Roman Empire, the battle of Actium, Herod the great, and the destruction of Jerusalem in 70AD. ii. The Messiah would be born in Bethlehem (Mic 5:2 c/w Mat 2:4-6). iii. The Messiah would be born of a virgin (Isa 7:14 c/w Mat 1:21-23). iv. The Messiah would be a descendent of David (2Sa 7:12-16 c/w Mat 1:1 c/w Act 2:29-32). v.	The kings of the earth and the people of Israel would conspire against God's Christ (Psa 2:1-2 c/w Act 4:25-28). vi. The Messiah would be betrayed by a close friend (Psa 41:9 c/w Joh 13:18,26) for 30 pieces of silver (Zec 11:12-13 c/w Mat 26:14-16 c/w Mat 27:3-10). vii. The Messiah would be killed by crucifixion (Psa 22:16 c/w Zec 13:6 c/w Joh 19:16-18,37).